Marketing without the right strtategy will lead to unrealized goals. 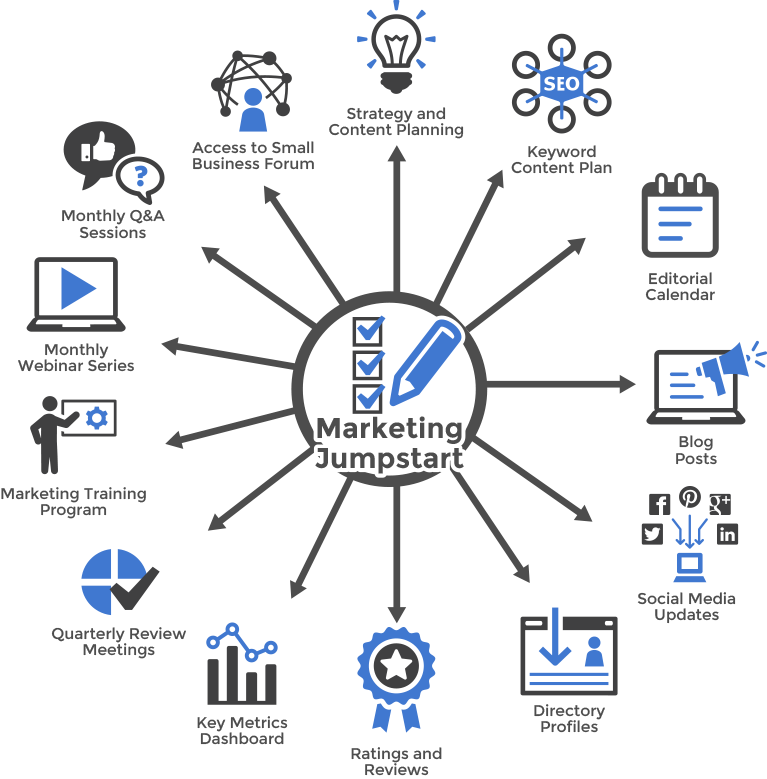 building a Marketing Jumpstart System with us that is designed to deliver results..
We conduct research to discover what your business does well, where it can improve and what keywords you should be targeting. We start with with marketing research and develop a comprehensive marketing plan tailored to meet your business objectives. We unify your business' directory listings, develop citations and work consistently to improve your rankings targeted keywords in your geography. We work to make sure that your business can be found locally on Google maps. We build out a content calendar based on keyword mapping that will attract the right audience. Our content planning services include social media posts and content marketing specifically designed to improve your search rankings and increase customer trust. We give you the infrastructure to collect positive reviews and ratings to make your local search profile stand out. We leverage your customer list to encourage online reviews on Google My Business, YELP, Facebook and other targeted review sites. You've worked hard to satisfy your customers and the world should know about it. Optimization of your current website as well as link building, local optimization and keyword ranking reports form the foundation of our SEO services. SEO is always changing and needs to be a part of your evergreen marketing strategy. This is the core of attracting the right customers and the right time. We help you build the foundation you need to continue to grow your business month after month. We have fine tuned the Marketing Jumpstart Program to do just that. Jumpstart your marketing with an established program built to deliver results. We work hard to have a comprehensive approach to your business by not just concentrating on one aspect of your your strategy.